As India will commemorate its diamond jubilee in 2022 to mark its 75 years of Independence, the NDA government has pulled up the socks to ensure that a decade-long dream of having the first bullet train in India, is realized. 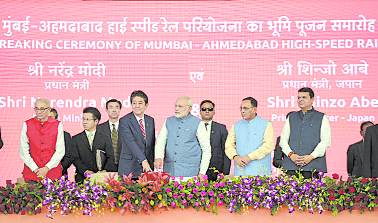 The first step in this direction is taken on September 14 in Gandhinagar, Gujarat when the visiting Japanese Prime Minister Mr. Shinzo Abe and India's Prime Minister Mr. Narendra Modi laid the foundation stone for the maiden 508 km long high-speed rail project between Mumbai, the commercial capital and Ahmedabad, the iconic city of the country. Mr. Modi succinctly underscored the importance and significance of the rail project, the first of its growth-propelling genre, by remarking that "more productivity with high-speed connectivity" is what the nation would gain from the bullet train. He rightly stated that the prestigious bullet train will be a game-changer, besides being 'a symbol of New India' that his government seeks to build by 2022. A little background is in order to render the euphoria generated by this project across the country a bit enduring and to highlight the huge challenges and humongous opportunities ahead once the project is commissioned. Mumbai-Ahmedabad High Speed Rail (MAHSR) project has been sanctioned for implementation with technical and financial underpinnings from the Government of Japan. National High Speed Rail Corporation Limited (NHRCL) has been incorporated as a Special Purpose Vehicle (SPV) to undertake the implementation of this project with a joint feasibility report contending that the project is targeted for commissioning in 2022-2023. With the Prime Minister Mr. Modi keen on commissioning the project on the 75th year of the country's independence in 2022, the project deadline is advanced by a year. For people inured to hearing and witnessing the wonders wrought by high-speed trains in the continental European countries, Japan and China, the image of a similar modern train criss-crossing the country's major cities is a dream come true. Many an analyst of global geopolitical trends say the picture of the platypus-snouted blue and white Shinkansen (the name of the Japanese bullet train) speeding past a snow-capped Mount Fuji has become a part and parcel of Japan as its popular sushi. Since October 1964, when the first bullet train broke the time it took to cover the 582 km between Tokyo and the commercial hub of Osaka to four hours( now it is down to two hours, 22 minutes), the Shinkansen has emerged as the iconic image of Japan's post-war pinnacle to economic supremacy in the globe. The Japanese bullet train exemplifies the archipelago's engineering efficiency and incredible standards of safety and punctuality. So far, the Japanese bullet trains had carried ten billion passengers sans a single accident or casualty with an average enviable delay of less than one minute! It is small wonder that the Prime Minister Mr. Modi is fully convinced of the worth and wealth it would bring forth to the economy through efficiency gains of unquantifiable amounts. That is why in his foundation-stone laying ceremony Mr.Modi said the high-speed corridor should be seen in the context of overall economic development. He contended that considering the time it takes to reach the airport and then take a flight and eventually reach the destination in the city, the bullet train would take half the time for people to reach their destinations, unhampered by any intervening and common obstacles such as traffic snarls, pollution and road rage. This would also spawn a lot of savings by consumption of fossil fuels. For Japan, the prestigious project in India has been hard-won as it deems friendship with India a strategic gain and geopolitical victory of sort when it outsmarted China by offering a loan worth 12 billion US dollars at 0.1 per cent interest to be disbursed by India over 50 years. This duly takes care of over 80 per cent of the project's estimated cost. Japan would also supplement the financing with the largesse of technical assistance and training package. The bullet train project in India must perforce have to be viewed from a new perspective. India's first train way back in 1853 between Bombay-Thane covered the 34 km distance in about an hour. More than several decades later and a century, the average speed of the Indian Railways is among the slowest in the world at 60 kms per hour. Even the country's fastest train Gatiman attains a top speed of 160 kms per hour. But, if things swing according to the authorities' calculations, the high-speed rail at its acme would operate at more than twice this celerity to win credibility and concurrence of many an Indian wishing to see a modern nation relishing panoply of comforts and convenience. and slow investment from private sector with the government doing the heavy-lifting of public investment, this is a viable way of making exemplary use of low-cost surplus capital sloshing in abundance globally to build modern infrastructure in India. In fine, the high-speed rail project is bound to bring immeasurable benefits to the Indian economy if the teething troubles and managerial snafus get overcome through well-laid advance plans and rigorous executing standards and sticking to deadline milestones with metronomic precision. (The author is formerly Deputy Editor The Hindu Group and is currently freelance commentator on economic issues. )Views expressed in the article are author's personal.